If you’ve seen my video Cover Crops and Compost Crops IN Your Garden, you know that I grow Bloody Butcher corn for cornmeal. I chose that variety because back in 1991 Mike McGrath made a big deal about it in Organic Gardening magazine. I liked the color and that it was an heirloom, so I grew Bloody Butcher the next year. I also put in a variety of yellow corn that year and Bloody Butcher did the best. I’ve been growing it and saving seed ever since. Growing flour corn is similar to growing sweet corn—except you just leave it on the stalk to dry. With sweet corn you are watching for just the right moment to pick it at its best. There’s not so much bother with flour corn. Nature protects the ears from the birds with the husks. That doesn’t help against the raccoons, but in his book Small-Scale Grain Raising, Gene Logsdon suggests putting old socks over each ear to protect from four-legged predators. I haven’t tried the socks. When it’s ready to harvest, the stalks will be mostly dry and often the ears will point downward, but not always. Choose a dry day and pull off the ears, husks and all. I pull back the husks on each ear and, using baling twine, tie the ears together in a long string, tying them where the ear meets the pulled back husks. I hang these strings in the barn out of reach of mice and birds. I usually do this in early September. The corn would have been transplanted about May 21 . The corn still needs to dry down a bit more after harvest, and I’m pretty busy anyway in September, so sometime in October I get around to shelling it. 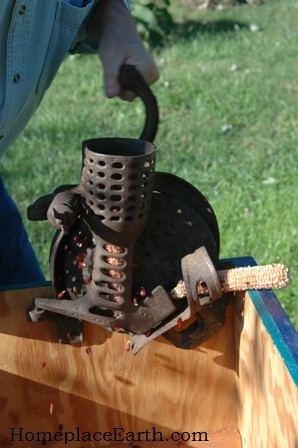 Shelling corn is a lot of fun if you are using a hand-cranked corn sheller. If you are using your thumbs it’s not so much fun and blisters form pretty quickly. You can find a shiny new red corn sheller at Lehman’s for $239. I see there’s one on the internet at Pleasant Hill Grain for $80. I’m sure there are differences, but besides the color (red and green), the only difference I can see from the pictures is that you need to adjust a wing nut for cob size with the Pleasant Hill model. The old ones I’m familiar with have a heavy spring that adjusts automatically. My favorite place to find corn shellers is antique malls. You can also find them on E-bay. I prefer the antique malls since I can see what I’m getting. No doubt, what you find will be rusty, but that’s okay. A little wire brushing will clean it up, but it would work fine as it is. Wood missing in the handle is one thing to look out for. There are plenty of good ones out there, but if you do end up with one missing the wood, you could use a handle suited to putting on a file, as a friend of mine did. 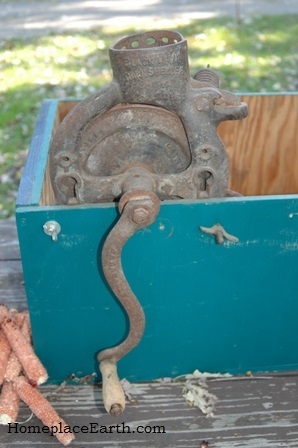 You should be able to buy an old corn sheller for under $50 if you take your time and keep your eyes open. A popular brand name is Black Hawk. 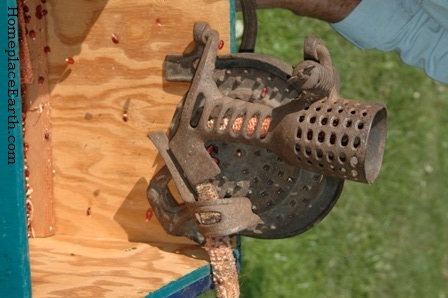 You need to attach a corn sheller to something, usually a wooden box that you’ve made. 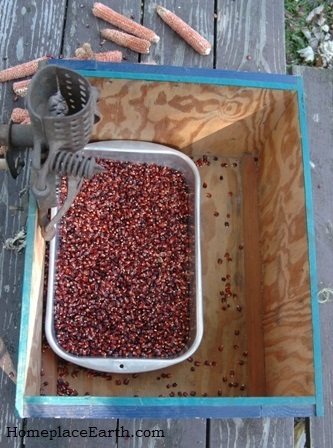 The shelled corn drops right into the box and the empty cobs shoot out and away. If you are really on a tight budget, you might want to go the primitive route and make a sheller out of a board and a few nails. 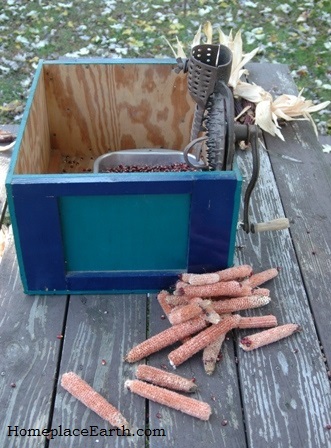 This 1983 article in Mother Earth News will show you how–http://www.motherearthnews.com/do-it-yourself/1983-01-01/a-primitive-but-free-corn-sheller.aspx. 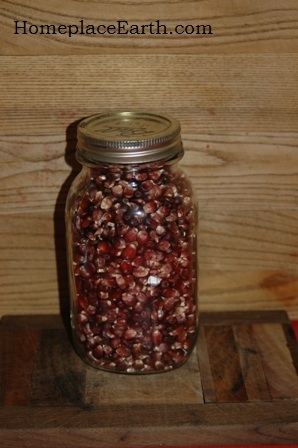 I wash the corn kernels as I did the wheat and you can check that out at my blog post Grains in Your Garden. Once it’s dry, I store it in jars in my pantry, after I put it in the freezer for a few days first to insure against insect damage. When I’m shelling, I take note of my best ears and keep that seed separate for planting next year. I might keep that in the freezer all year. Corn feeds us and the soil. Corn is an easy to grow grain that can be a staple in your diet. People who have issues with gluten can enjoy eating corn. The stalks provide carbon to feed back the soil by way of the compost pile. I chop them with a machete in lengths convenient for compost material. 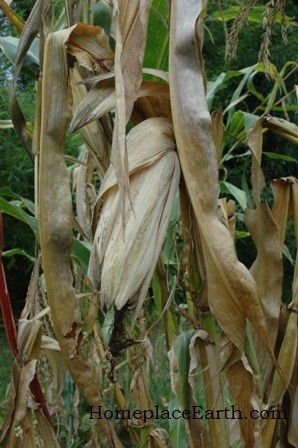 Corn is one of the “five crops you need to survive and thrive” that Carol Deppe wrote about in The Resilient Gardener. 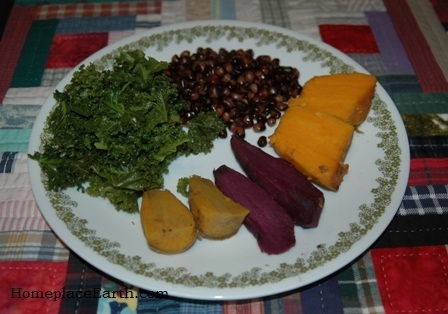 The other four crops are potatoes, beans, squash and eggs. 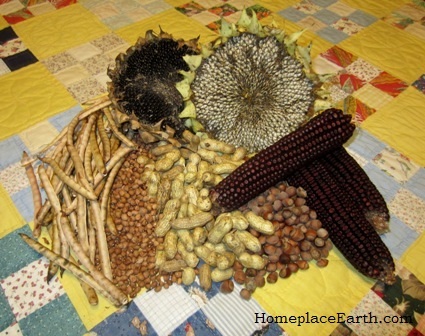 Deppe is a seed breeder and has developed certain varieties for particular uses and has come up with her own recipes. 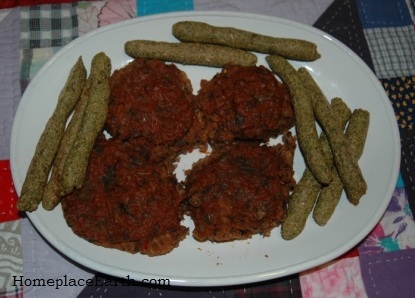 Being gluten intolerant herself, she has included her recipe for corn bread that contains no wheat flour in the book. Published only a year ago, this book is a “must read” for anyone wanting to grow a major portion of their diet. You can find out how the Hidatsa Indians traditionally grew and managed their corn by reading Buffalo Bird Woman’s Garden. It also covers squash, beans, and sunflowers and is an excellent historical account. With a little research you might be able to find out which heirloom varieties have been grown in your area. Or maybe you might read an article about an interesting variety and start from there, like I did. 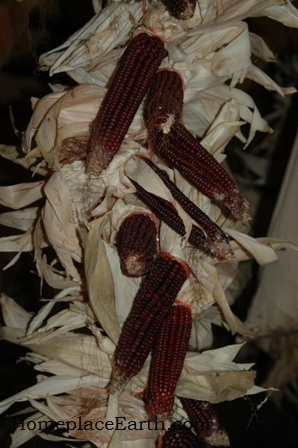 If you don’t want to have to grind corn and make cornmeal, but you would like the experience of growing corn and harvesting it dry on the stalk, grow popcorn. You can shell out just what you need at the time and it won’t be too bad on your thumbs. You could use the stalks for your Halloween decorations, then chop them for the compost pile. Even a small amount would be fun to get started with. I hope you keep corn in mind for your 2012 garden. I plant winter wheat in the fall, trying to have it in by mid-October. I broadcast it into a prepared seedbed and gently chop it in with a cultivator or rake. It could also be sown in furrows. Whenever I’ve tried transplanting it, the results were not as good, so I don’t transplant small grains. The time to harvest here in zone 7 is about the second week of June for wheat and the next week for rye. I cut it with the same Japanese-style sickle that I told you about in the post about the rye. Keeping all the grain heads going the same way, I put it in bundles, tying each with a wheat straw. 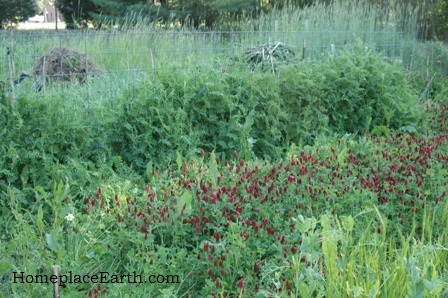 My video, Cover Crops and Compost Crops IN Your Garden, shows me doing that. The grain needs some more drying time before it is threshed. You could store it in a building, but make sure to protect it from birds and mice. I’ve gotten better at putting the bundles into shocks, so I do that and leave the shocks in the garden for about a week, then thresh. It’s okay if it gets rained on, and of course, the dew will fall each night. 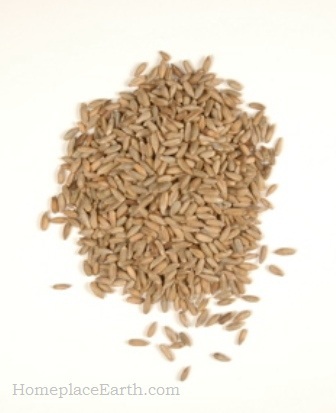 This weathering is all for the good and the changes in the grain make it better for your body to digest. I believe one of the reasons so many people have problems digesting wheat is because of how it is handled in our industrial food system. All the more reason to grow your own. Until now, my favorite way to thresh wheat and rye has been with a plastic baseball bat. I lay an old sheet on the ground and put a piece of plywood on top, with the other end leaning against the picnic table. From a standing position, I hold the wheat, heads down, against the plywood and hit the seedheads with the bat. The grain falls down to the sheet. I gather the sheet and can pull off a lot of the larger chaff with my hand. Everything else gets poured into a container for winnowing. That way is shown in my cover crop video. My newest method allows me to sit down on the job and use my feet. I use an old bread tray and insert a piece of 1/2 “ hardware cloth, but you could make a frame of 2×4’s with a 1/2’” hardware cloth bottom. I lean the tray against the picnic table bench as shown, sit in the chair in front of it, and use my feet to shuffle against the grain heads. The wheat seeds land all in one spot behind the threshing tray. 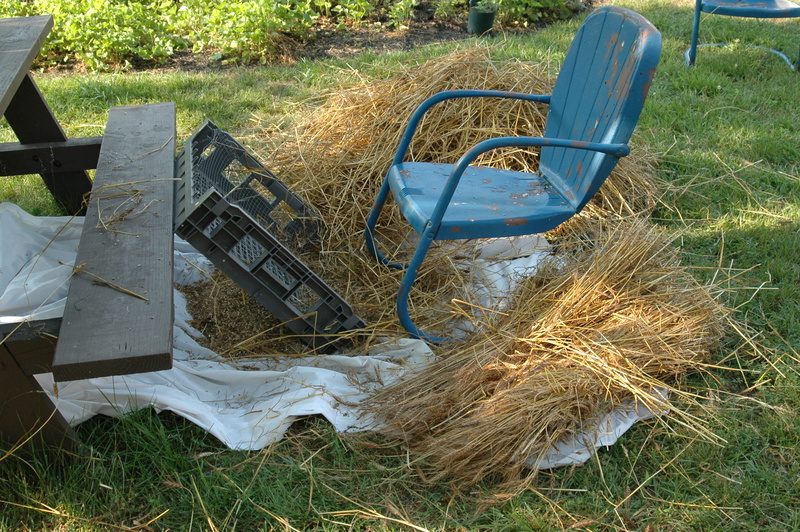 You can see the bundles of wheat on one side of the chair and the threshed straw on the other. I wear clean shoes that I save for that job only. 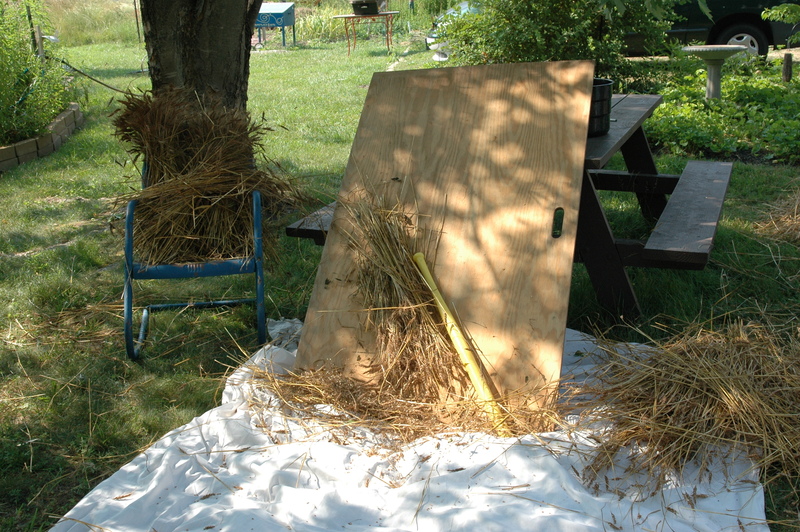 As before, I also used a sheet under everything so that I could gather it up and pour the grain and chaff into a container for winnowing. 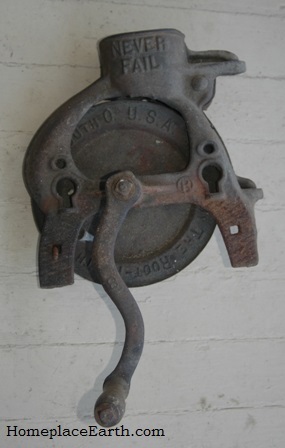 That frame with the hardware cloth will come in handy to hold vegetables for rinsing right in the garden. You can just spray them off and let them drain. The easiest way to winnow (separate the grain from the chaff) is to pour it from one container to another in front of a fan, making sure the bottom container is a deep one so the grain doesn’t bounce out. Do that a couple times. Don’t worry if every bit of chaff doesn’t come out, because it will all come out in the wash.
I’ve never read of anyone washing their grain, but I do. I’m not a clean freak when it comes to food, it’s just a practical management technique for me. I put the grain in a large bowl and add water. Any remaining chaff, underweight seed, insects, etc. will float to the top. You might even find a bird dropping that you threshed out of the straw. It happens. Pour off what has gathered on top and fill again, giving the grain a stir to release more stuff. Once you are rid of what floats off, you may notice some grit in the bottom of your bowl. That is from dirt you’ve harvested with the grain. 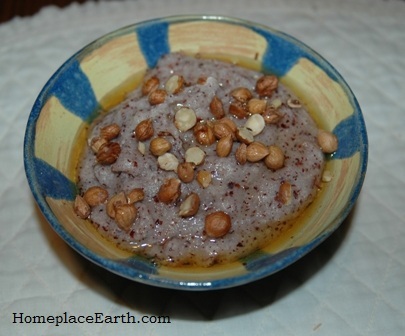 Pour it all through a strainer or colander that will keep the grain in and let that grit out. Having different sizes of sieves and colanders is good for using with many seed saving activities. Watch for them at yard sales and thrift stores and build your collection so you can accommodate the different sizes of seeds you will be saving in the future. Now for the drying. 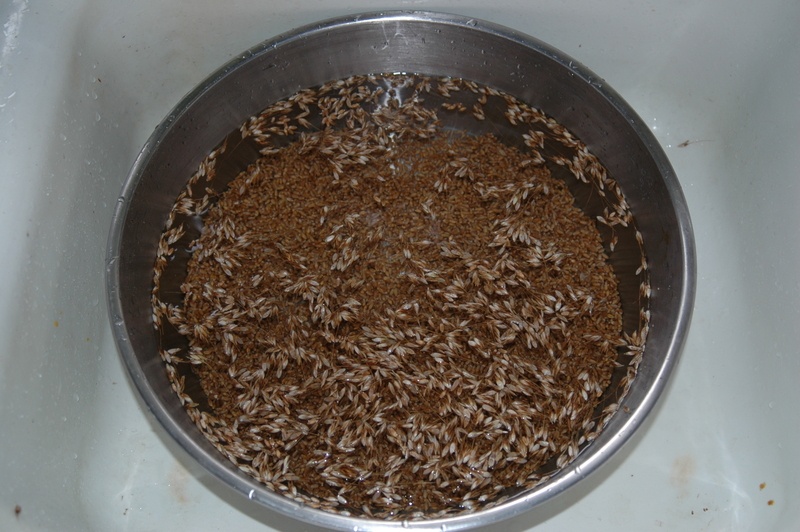 I first pour the grain out onto towels to air dry, then I put it in large cake pans or wooden bowls and let it set out until I’m sure it’s good and dry, stirring it around when I think about it. When I’m sure it’s dry, I put it in glass jars. There are faster drying methods, but that’s how I do it. I put the jars of grain in the freezer for three days to ensure there will be no insect problems. Then I store the jars in the pantry. 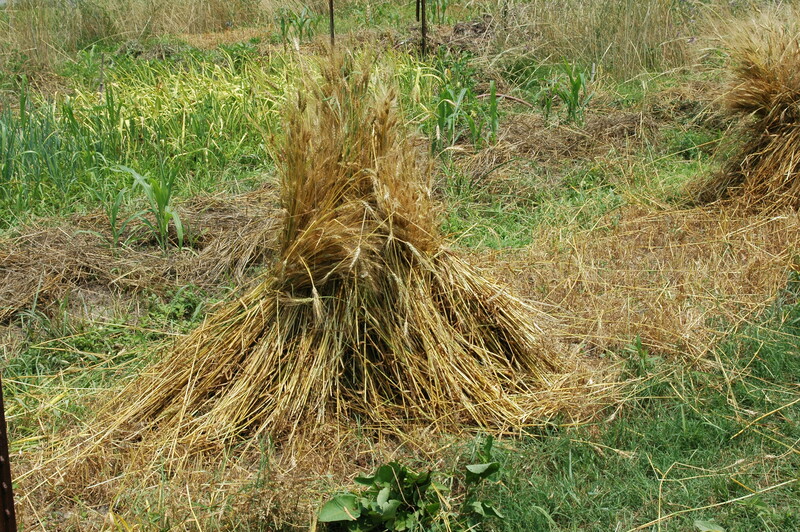 Grains are an important part of GROW BIOINTENSIVE Sustainable Mini-farming. John Jeavons of Ecology Action has posted some GROW BIOINTENSIVE videos on his website at www.johnjeavons.info/video.html. In Session 6, part B, you can see my friend Dan harvesting and threshing rye. The Ecology Action Booklet 33: Grow Your Own Grains: Raising, Harvesting and Uses by Carol Cox is full of good information. You can find that in the Bountiful Gardens catalog. The best yield I’ve gotten for wheat in my garden is 4.4 lbs. per 100 sq. ft. and for rye it’s 6.3 lb. per 100 sq. ft. It’s usually less than that, but I know I can do better and I’m always looking at different varieties. No matter what you’re growing, it’s important to find the varieties that do well for your particular climate and soil. Growing your own grain adds a new dimension to your garden. 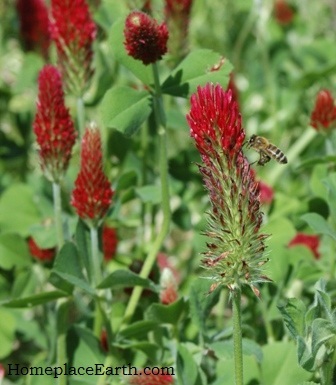 Even if you don’t want to grow it to eat, you could let some of your rye grow out to seed to save for your next cover crop. Growing even a small amount of wheat is especially fun with children. One year when my grandson was helping me thresh, we decided to read up on The Little Red Hen and were surprised to find several different versions of the same story at the library. We read them all. Make your garden an adventure and have some fun. 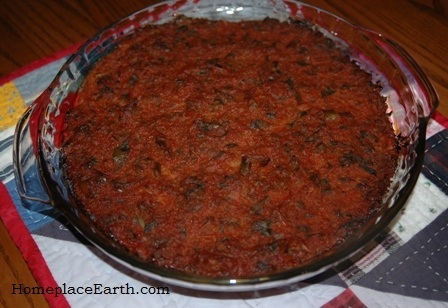 Maybe you can use some of your wheat for pizza dough. I have some tomatoes and peppers in the garden. Now if I could just grow some cheese.